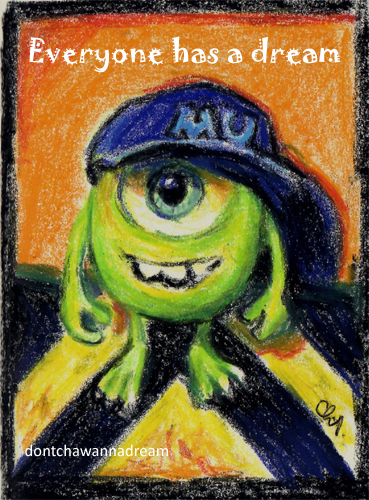 Here’s a very, very quick drawing of Mike Wazowski!! Made this earlier because I really wanted to wish you a very happy Easter ‘properly’, that is, with a new drawing since the purpose of this blog is to share my paintings and sketches. 😀 I’ve started a watercolor painting but I’m not sure I will find the time to finish it this weekend. I found this cute pic, the young version of Mike. Monster University is such an awesome movie!! I watched it 2 times and a half on a flight 2 months ago. Yeahhh, I love Disney and Pixar! 😉 I’m usually really stressed on planes so no drama movies for me! HAPPY EASTER / Joyeuses Pâques!! Chocolate for 3 days in a row, yihaaaa!!! Great painting, Cha! I never did see that movie, though I saw the first one. Pixar movies are all so well done. Thanks very much. Watch this one I’m sure you’re gonna laugh as much as I did!! Thanks a lot, dear Sue. Hmmm cakes 🙂 I’m sure you’re a good cook!